Are you planning on painting that new house or condo you just purchased. 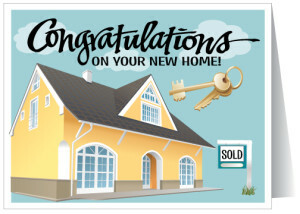 Congrat’s to begin with on making the biggest purchase decision of your life. If you are doing your own painting, then we’d like to share a few quality house painting tips to help you follow before any paint application occurs. Of course we are somewhat biased and are going to suggest hiring a professional house painting contractor so you get the absolute perfection and quality results your new home deserves and you can enjoy without the frustration and all the work, as there is so much more to be done. To begin it’s not as expensive as people may think to hire a professional painter to adorn your home with precision cut paint lines. Perfect paint brush strokes where you can’t see the cut lines and no messy paint spots on the ceiling or floor. A quality house painting project begins with thoroughly preparing your home’s wall surfaces and all woodwork. From cleaning, to caulking, spackling otherwise known as mudding (the application of a drywall compound) and sanding, the condition of the wood and walls is critical preparatory steps to take before you begin applying any paint. Before you even consider opening that paint can you must prepare all surface areas that will be painted. As a DIYer you may think it’s not important if you skip through some of the preparatory process but you want to be able to look at your finished paint job when you’re done and be proud to show it off. See our list of house painting services if you change your mind and decide to hire a painter. Imperfections to the walls, drywall, woodwork and framework are not as easily visible to a DIYer or to a NON-professional painter. Certain paint colours and finishes will increase the visibility of these imperfections and will leave you feeling defeated and unhappy. After the imperfections are covered with a light drywall compound we sand and smooth it before we apply any primer. We use quality paint primer products from Benjamin Moore Paints to level and smooth out the imperfections. The primer provides a good base coverage before the paint is applied. We also ensure that any woodwork such as the door frames, window frames, baseboards, crown moulding, coving is also properly prepared before priming. We fill the nail pops/holes with a putty, sand and caulk before applying primer or paint. A professional House painting contractor will absolutely be familiar with drywall installation as well as drywall repair and will know how to fix any imperfections. We’ve fixed, nail pops, bumps in the drywall and even curved drywall that was installed by not so professionals. An experienced and professional reliable painter will absolutely be able to make a difference in the look of the drywall and provide the homeowner quality painting results. To achieve quality in your home painting project you should thoroughly sand all wood trim and molding, baseboards and cove. Priming follows the sanding and smoothing down previously painted woodwork (trim, molding, casing, doors and windows) . We thoroughly sand, wipe and or vacuum the dust off the woodwork so as to provide a better paint adhesion for both primer and paint. These are quality and professional practices we follow for any home painting and home improvement work we do in the Ottawa area. If it’s newly installed wood work we still give it a sanding and ensure all nail pops are filled. Crown Moulding, base boards and window and door frames over time will eventually separate and or pull away from the ceiling or walls after they’ve been installed, leaving gaps. This often times happens in newly built homes within a few weeks as the house begins to settle and the new wood adapts to the humidity and temperature levels in the home. This is not the installer’s fault. Even after years since the installation you’ll find there are the same separating gaps. It’s OK though, an expert painter will know that those gaps need to be filled with caulking before any paint is applied. The homeowner unknowingly may just paint over it noticing that the paint covers the gap. Trust us when we say after 30 years of house painting experience covering those gaps with just paint will alleviate those gaps from coming back. As the paint dries it will highlight those gaps once again. A NON-professional painter will just paint over it too cause it gets the job done really quickly and they will be long gone before you even notice it. Using an acrylic latex caulk with silicone for best results. The caulking tube is loaded into the caulking gun. Cutting the tip of the caulk bottle in a 45 degree angle you’re almost ready to start caulking. Just remember to dust or brush away any debris left behind from the sanding. Grab a damp towel or rag and have a finger ready to go 🙂 Starting in one corner, begin the application of the caulking, squeezing the caulking gun and streaming it along the seam of the woodwork (between the gap and the ceiling or wall). Get that finger ready 🙂 Once you’ve applied a few inches worth, slide that finger along the caulk and smooth it out. This will ensure further filling of those gaps as well as smooth out the caulk. Simply remove/wipe away any extra with the dampened rag or towel. Take Note though that once you’ve applied the caulking and smoothing it out with your finger it is not something that will be sanded like you or we did with the drywall compound mixture. If the gap is bigger than that one caulk application, no fear simply repeat the process. Moving along the entire ceiling, walls, baseboards and trim areas until all gaps are filled following the same simple process. Apply, smooth out with finger, wipe away any extra. Also you must note that caulking must be fully dry before any paint can be applied. Although we’d like to believe wall paper is a thing of the past still many interior designers recommend it to their clients. It’s actually making a comeback. What’s old is new again they say. Many homeowners like a focal wall in wallpaper too. Although more often than not our service calls are for removal of wallpaper and painting over it. 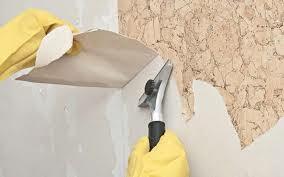 Here is the process if you are removing wallpaper and are repainting the wall afterwards. d some are worse than others. But what needs to be remembered and strongly considered is that if the proper care of the paste removal is not taken than any paint high quality or not, higher end cost or not will absolutely not give you the results you are anticipating. It won’t be perfect paint coverage unless the remaining wallpaper paste is removed and sealed. Removal of the paste: Spread newspapers around the area of where the wallpaper is removed, so that it soaks up any of the water that drips from the walls to the flooring. Fill a pail with warm water. We mix the warm water with DIF (following the directions on the bottle) if it’s that stubborn kind of paste. Sometimes we will use a steamer if it’s a lesser stubborn paste. Warm water works best. You the DIYer can simply use a spray bottle or sponge. This DIY contains a certain enzyme that will break down that paste, hence making it easier to scrub away. If there’s nothing else you do, please do the following in order to achieve the best possible results before painting. No matter what and how hard you try there will always be traces of the paste left behind. Oil priming it will prevent it from rising up into the latex paint topcoat. There are many LOW to no VOC primers in the Benjamin Moore collections that are premium products for this coverage. 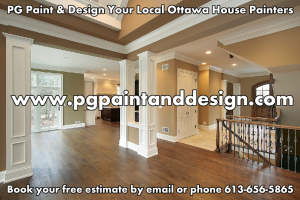 Professional Ottawa Painters – PG PAINT & DESIGN ensure you get high quality professional home painting results every time. 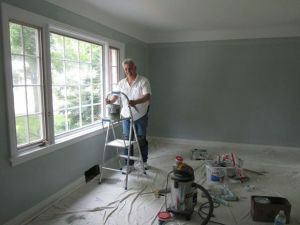 From the in home estimate we thoroughly explain all the fine details of the required house painting job requirements. With the experience and knowledge that 30 years in the painting and drywall installation and repair we feel confident in saying we are your Ottawa Painting Experts and Professionals. 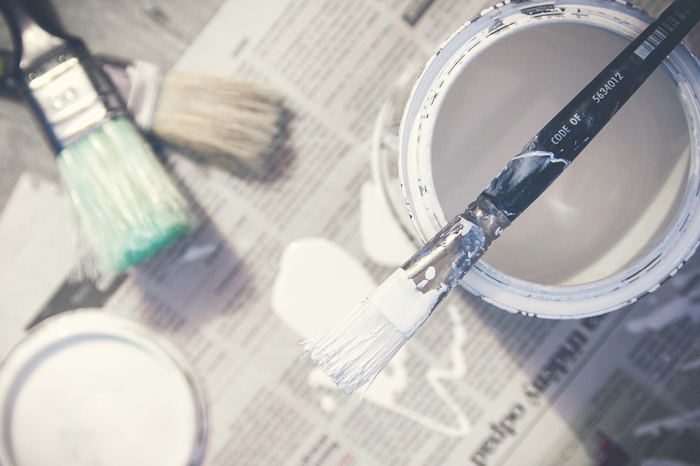 As an enthusiastic DIYer you may or can achieve decent results, but we highly recommend following our tips before painting. So that as well informed consumers and homeowners you will be armed with all the necessary information before attempting to DIY your next home painting project or home improvement and repair. If you don’t get the answers you’re looking for, and the paint contractor is being vague or avoiding to let you know exactly the brand and quality of paint or other products they are using as well as a detailed list of what the scope of the work will be then be weary as they may be masking or cutting corners yet you’ll be paying the higher price, with low end products, low quality workmanship and you will be left unsatisfied upon the completion of the painting of your home. Do Not Be afraid to ask any questions and remember there are no silly or nonsense questions when it comes to having someone working in your home. A professional house painter will always be liberal and upfront with explaining exactly all the work they will do and the brand and quality level of the paint or any other materials they will be using. It should be noted that there are Red Flags to look for before hiring a painter, you should think twice about allowing or hiring someone into your home that says they are professionals and then they become defensive or vague with any of your questions, they also should not make you feel like you are asking too many questions or that they are silly ones. 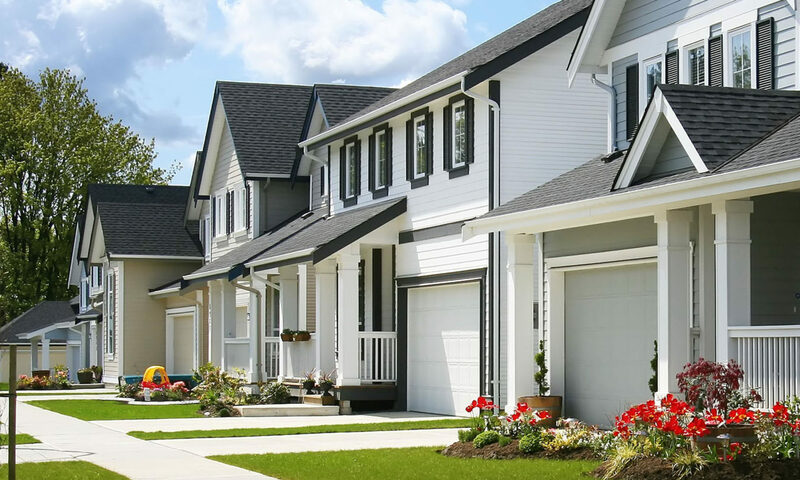 You are the homeowner / client and in our books that makes you the decision maker and if you need to ask and have all the information before choosing your next home painting contractor than we are at the home consultation for as long as need be. We don’t time it to 20 minutes per client let’s say. If you need our assistance and guidance then we will stay until all your painting questions have been answered. We continue to be aavailable for questions or concerns during and after the house painting. At PG PAINT & DESIGN we are open to all your questions and concerns. We give our best and exceptional painting services to all our clients. We look forward to answering all your questions and concerns at our meeting. Contact Us to schedule yours today.